The Natural History Museum in London is a popular place to visit for both locals and tourists. It has a wide variety of exhibits covering many areas of science and history, and everybody can find something in the museum that interests them. The museum was first established in the mid-1700s, when Sir Hans Sloane sold his collection of about 70,000 artifacts to the British government. They built the British Museum to house the items, but by the 1850s, the collection had grown too large for the space. After the museum’s board of trustees held a contest to design the new building, the new building opened on April 18, 1881. The natural history museum was a part of the British Museum until 1963. In 1986, it combined with the Geological Museum of the British Geological Survey, and the Lasting Impressions gallery was created to connect the buildings. It was renamed the Museum of Natural History in 1992. The museum’s galleries are split into four zones: red, green, blue, and orange. The Red Zone focuses on Earth science and Earth’s history. It is home to the most intact Stegosaurus fossil that has ever been discovered. The fossil is about three meters tall and six meters wide. In the Earth’s Treasury gallery, you can see rare minerals, rocks, and gemstones. In the Restless Surface gallery, you can learn about the effects of water and weather on the Earth. The Human Evolution gallery has a 3.5-million-year-old Laetoli canine and many other fossils and artifacts. You can also visit a gallery that focuses on volcanoes and earthquakes. The Blue Zone has several exhibits about life on Earth, from millions of years ago until today. The dinosaur gallery has the first Tyrannosaurus rex fossil ever found. In the Fishes, Amphibians, and Reptiles gallery, you can see a variety of unusual fish and other species. In the Human Biology gallery, you can see a giant cell model, a real brain and spinal cord, and a real DNA sample. The Images of Nature gallery has prints and paintings dating back 350 years as well as interesting modern photographs. The Blue Zone also has a gallery devoted to fossils of mammals, a blue whale model, and an exhibit on marine invertebrates. All of the galleries in the Green Zone relate to the environment and the evolution of life forms. The museum’s bird gallery features endangered species and native British birds. In the Creepy Crawlies gallery, you can see an exhibit on crustaceans, a model of a termite mound, and an exhibit on how insects communicate. In the Investigate center, you can use microscopes and other equipment to see plant and animal specimens. The Vault gallery has the largest and most diverse collection of colored diamonds in the world. The Green Zone is also home to Hintz Hall, a cathedral-like area where you can see a statue of Darwin, a 1,300-year-old sequoia, and a woolly mammoth skull. The Orange Zone only has two galleries: the Darwin Centre and the Wildlife Garden. The Darwin Centre’s Cocoon has hundreds of preserved specimens on display, including beetles, plants, and tarantulas. The Zoology Spirit Building also has a range of preserved animals, including snakes, sharks, and a giant squid. The Attenborough Studio hosts live shows and lectures by scientists. The Wildlife Garden has more than 2,600 species of flora and fauna, including butterflies, tadpoles, and woodland plants. The garden is usually open from March to November every year. The natural history museum hosts several talks, lectures, and seminars each year. These events feature experienced professionals in the science community and allow people to learn, have discussions, and ask questions. Every few weeks, the museum hosts a “Crime Scene Live” night where you can explore the museum to find clues to solve a crime. They also have after hours events for both adults and kids where visitors can stay up all night enjoying food, music, and films. Throughout the museum, you can find several places to buy food and drink. The Restaurant, which is located in the Green Zone, has pizzas, pastas, and burgers. In the Red Zone, you can visit the Deli Cafe, which sells sandwiches, wraps, and salads. In the Blue Zone, you can eat at the Central Cafe, which offers sandwiches, salads, pastries, cakes, and fruit. You can also visit the Darwin Centre Cafe in the Orange Zone for sandwiches and salads. The Museum Shop sells gifts and souvenirs including art, puzzles, toys, and homeware. The Cranbourne Boutique, located in the Red Zone, sells decorations, replicas of some of the museum’s specimens, and fashion items. For all items related to dinosaurs, you can visit the Dino Store in the museum’s dinosaur gallery. The store sells toys, mugs, puzzles, and T-shirts all relating to the prehistoric era. The natural history museum is open every day from 10:00 a.m. to 5:50 p.m., but they don’t allow entry after 5:30 p.m. Admission is free, but some temporary exhibits have entry fees. The cost for the temporary exhibits is usually between about £5.00 and £10.00, or about $7.00 to $14.00. 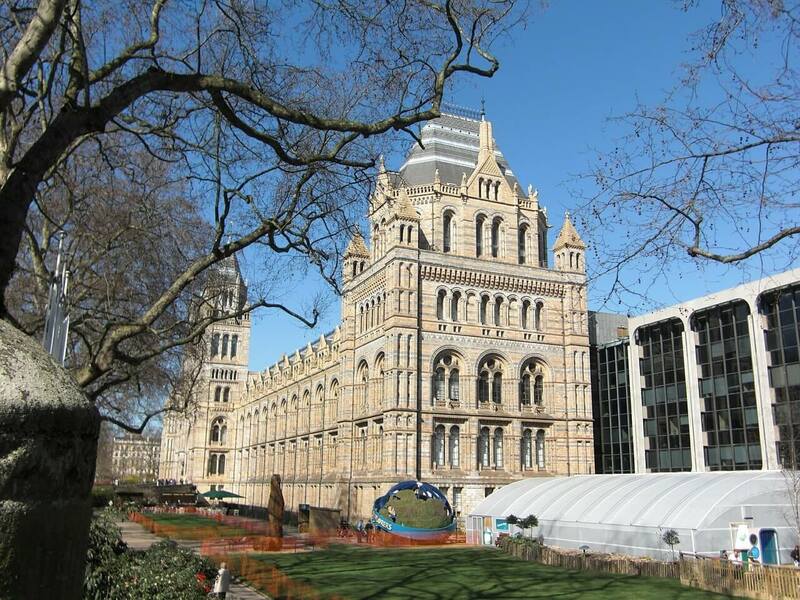 The museum is located in South Kensington. Its main entrance is on Cromwell Road, and there is a second entrance on Exhibition Road. The museum is only about a five minute walk from the South Kensington tube station, which can be accessed from the District, Piccadilly, and Circle lines. You can also travel to the museum by bus or by bicycle. The museum does not have a parking lot, so most people choose not to travel by car. There are cloakrooms in Hintze Hall and by the entrance on Exhibition Road where you can leave coats and luggage for a small fee. If you or someone in your party requires a wheelchair, you can rent one for free from one of the cloakrooms. 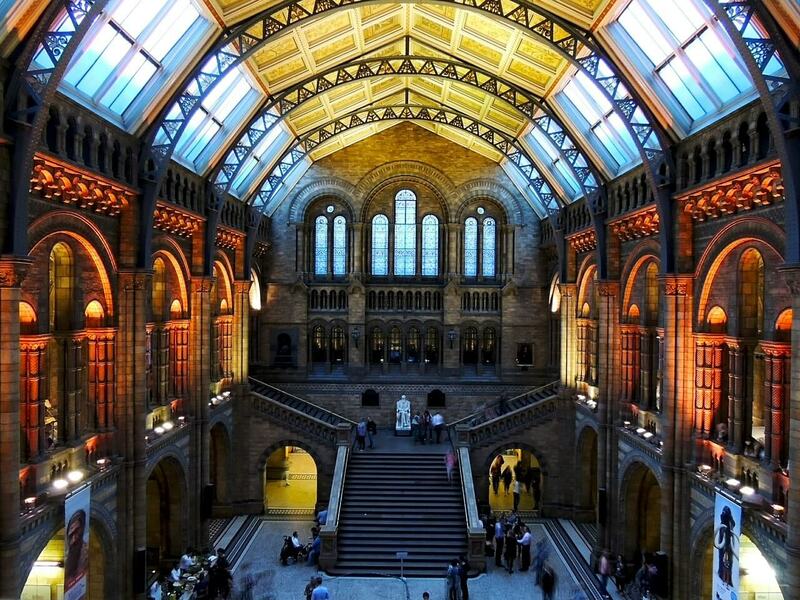 The London Natural History Museum has galleries and exhibits on almost every scientific topic imaginable. The museum is an excellent attraction to visit, whether you’re traveling alone, with friends, or with your family. Public transport: Tube: South Kensington Train: Victoria/Paddington. Either use pedestrian tunnel from South Kensington station and exit where signposted or walk up Exhibition Road and cross Cromwell Road to locate museum.